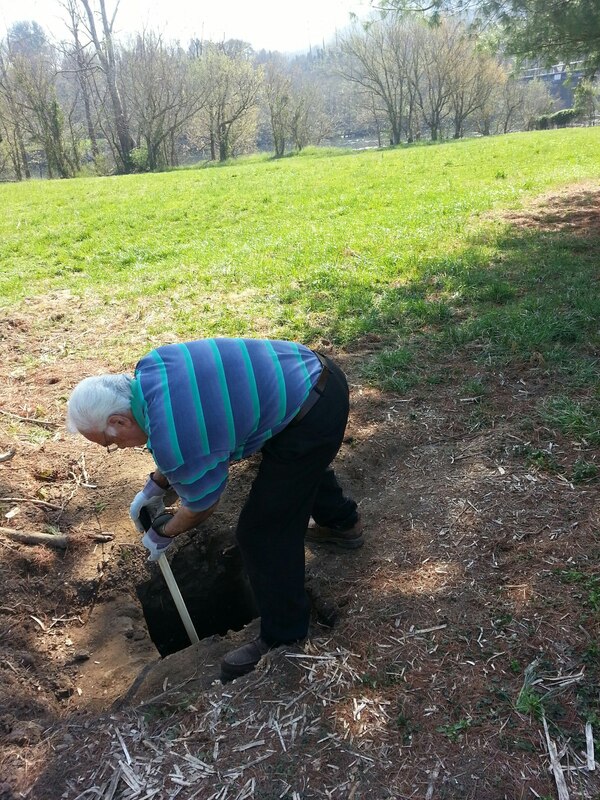 SD Dean measuring depth of initial STP into the refuse pit. The Rotherwood site, on the Holston River in Kingsport, was first brought to my attention several years ago by a former member of the old Kingsport Chapter of the Tennessee Archaeological Society. He had given me permission to examine and photograph his archaeological collections from the upper East Tennessee area. I noted that he had both Dallas and Pisgah pottery sherds from the site as well as a field map depicting a couple of house floors from avocational excavations at Rotherwood in the 1980s. Much of the area was developed for a residential neighborhood, and a lot of dirt was removed for fill. I had been led to believe that the site was essentially destroyed. In a pedestrian survey of the area around the Rotherwood site in 2013, my friend and colleague, SD Dean, noticed that a white pine tree on the southern periphery of the site had been blown over in a storm. He asked the landowner for permission to excavate a shovel test pit (STP) in the tree fall sediments. Dean called me when he opened the pit up, and we believed at the time that he had excavated into a village midden. We recovered >100 potsherds, fauna, charcoal, river mussel and ios gastropod shells, and even fish scales from the STP. The “midden” appeared to be about 50cm thick. Below that was sterile river sand. We were excited about the density of material from one STP, and more importantly, it was exciting to know that the Rotherwood site had in fact not been destroyed. An AMS radiocarbon date from wood charcoal and one OSL date from a Dallas McKee Island Cord Marked sherd placed the “midden” in chronological context about AD 1520-1580. Profile View of the Refuse Pit. In July of this year, we began a testing program at Rotherwood which included geophysical survey and excavation of several 2 x 2 and 1 x1 meter excavation units. The geophysical survey was preliminary and focused on two areas: 1) an area just west of the where the previous house floors had been excavated, and 2) an area centered around the “midden” we located in 2013. Unfortunately, no new house floors were identified, but a buried surface was located approximately 30-35cm below surface in which the midden originated. Plan View of the Roasting Pit. 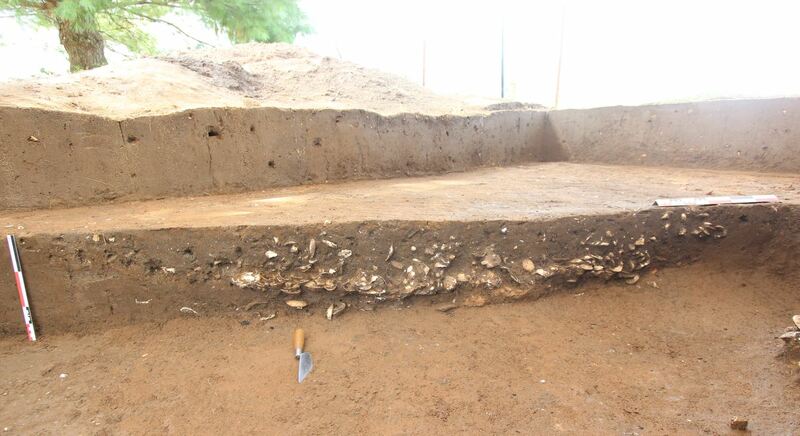 Our excavations revealed that the “midden” was in fact a large pit measuring 2m in diameter and 35-50cm deep. It was most likely what Roy Dickens called a borrow pit, excavated originally to re-plaster house walls or for some other construction purpose. This idea is further supported by the fact that such pits are rare on sites that predate permanent villages in Southern Appalachia. A net effect of such a pit, however, would be its immediate availability as a refuse pit. This appears to be the case for our pit at Rotherwood. We recovered house daub along with myriad river mussel and ios shells, wood ash, broken pottery vessels, and abundant fauna. The pottery assemblage represents a late Dallas Phase occupation, but we also recovered several Pisgah sherds (much like Holliston Mills just downstream). There were also a few sherds that look more like wares we typically recover on the Watauga and Nolichucky – wares that bear great similarity the Qualla and Nolichucky Series. 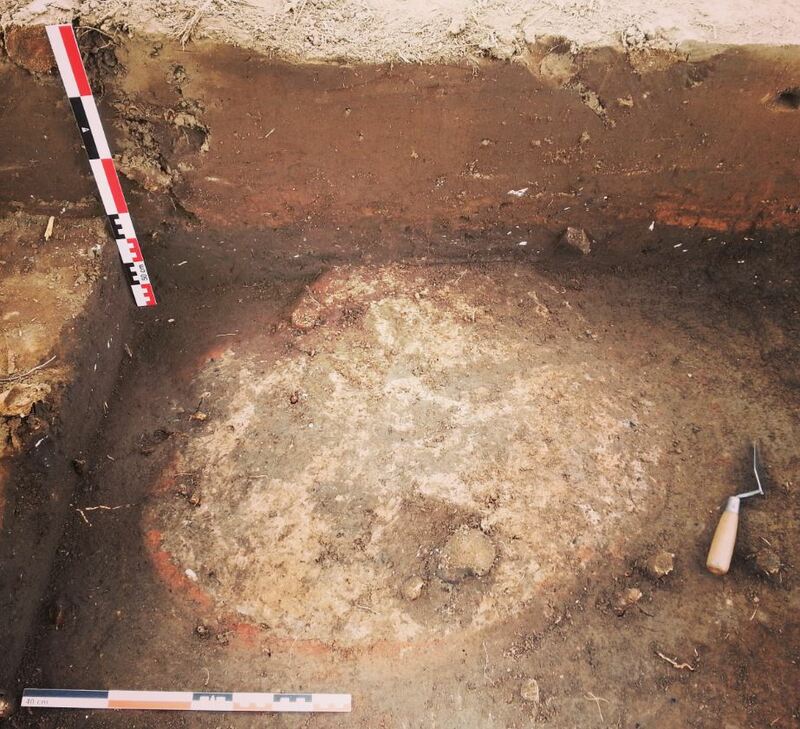 Toward the end of our excavation, we uncovered a roasting pit abutting the refuse pit (in fact, the refuse pit sediments covered over the roasting pit). The roasting pit had burned edges and was full of the same wood ash as in the refuse pit. We even recovered a few mussel shells that did not open during roasting. Plan View of Refuse Pit (larger one on left) and roasting pit (smaller one on right). Note the exposed roots from the tree fall that initially exposed the feature area. In sum, while we had hoped to gain greater insight into Mississippian community structure at Rotherwood, we were excited to excavate the remains of what was almost certainly a single household activity area. 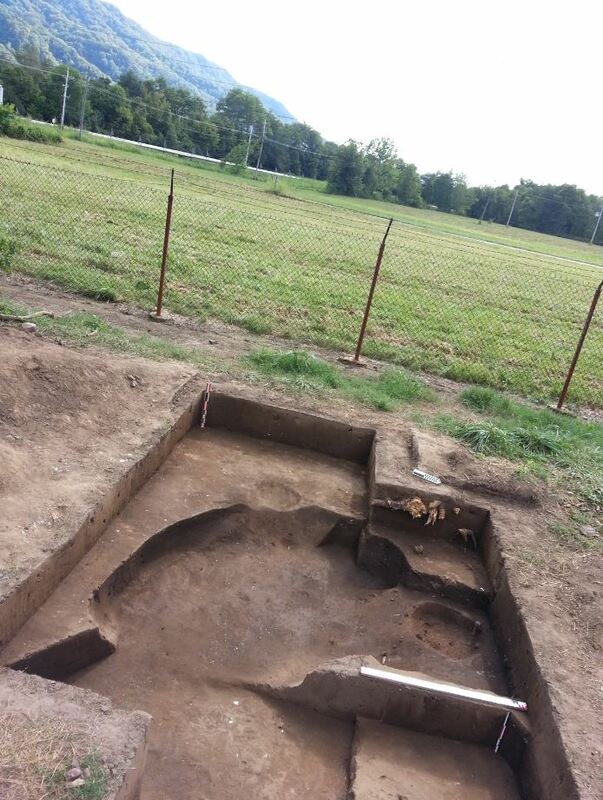 Analyses are currently ongoing at the ETSU Valleybrook archaeology laboratories, but we hope to gain a finer grained understanding of activity and consumption at the household level since these features likely represent very short term deposition. New AMS dates are forthcoming to augment this idea. We also now think that instead of finding the southern edges of the site that it appears more likely we actually found the northern periphery of the site. More geophysical surveys will also be forthcoming toward delimiting site boundaries and community structure. Dickens, Roy S., Jr. 1985. The Form, Function, and Formation of Garbage-filled Pits on Southeastern Aboriginal Sites: An Archaeobotanical Analysis. In Structure and Process in Southeastern Archaeology, edited by Roy S. Dickens, Jr. and H. Trawick Ward, pp. 34-59. University of Alabama Press, Tuscaloosa. Franklin, Jay D., Elizabeth K. Price, and Lucinda M. Langston. 2010. The Mortuary Assemblage from the Holliston Mills Site, a Mississippian Town in Upper East Tennessee. In Mississippian Mortuary Practices: Beyond Hierarchy and the Representationist Perspective, edited by Lynne P. Sullivan and Robert C. Mainfort, Jr., pp. 325-350. University Press of Florida, Gainesville.